Preston Dennet may best be known for his UFOlogy research. According to his website he has already published nine books on UFO's and five books on the paranormal. That's 14 books, but on the same website his bio says 13. Preston Dennett began investigating UFOs and the paranormal in 1986 when he discovered that his family, friends and co-workers were having dramatic unexplained encounters. Since then, he has interviewed hundreds of witnesses and investigated a wide variety of paranormal phenomena. He is a field investigator for the Mutual UFO Network (MUFON), a ghost hunter, a paranormal researcher, and the author of thirteen books and more than 100 articles on on UFOs and the paranormal. 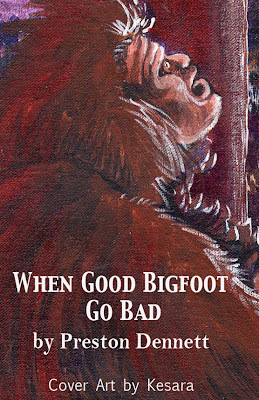 He may need to update his homepage, especially since he will soon add another book, "When Good Bigfoot Go Bad." Is Bigfoot Hostile? Or is Bigfoot friendly? In this article, we will explore some of the most extreme cases of Bigfoot hostility and Bigfoot friendship. Bigfoot is not only real, there are well-documented cases of Bigfoot attacks and even kidnappings. On the other hand, some people claim that Bigfoot has saved their lives. Which is the truth? Read about these cases for yourself. While Bigfoot has been reported across the entire world, California contains what appears to be the world’s highest population concentration of the creature. Writes leading cryptozoologist Loren Coleman, “It has been estimated that the population of Bigfoot in the Pacific Northwest is between two thousand and four thousand individuals, with the greatest concentration around Bluff Creek, California…Bluff Creek is the Mecca of the Bigfoot field.” Coleman has compiled a list of the top twenty Bigfoot hotspots in the world, and Bluff Creek heads the list. Not surprisingly two other places in California (Willow Creek and the Antelope Valley area) are also on Coleman’s top twenty list of Bigfoot hotspots. For whatever reason, California is hopping with Bigfoot. Literally hundreds of cases come from virtually all corners of the state. Reports of the hirsute beast reach back almost two centuries and continue to the present day. There is surprisingly strong evidence supporting the reality of Bigfoot including movie films, photos, audio tapes, footprints, body-prints, hair samples, dung samples, animal reaction cases, and of course the thousands of eye-witnesses, many of high integrity. By far the most common type of California Bigfoot encounter is seeing a 7 to 12 foot-tall hairy biped traverse the highway late at night. Most other encounters are even more brief, usually involving the sighting of large footprints, smelling the foul odor of a Bigfoot or hearing its howl. It is very rare that a Bigfoot actually interacts with a witness. And in those cases where there is interaction, it is usually limited to both parties stumbling upon each other in surprise and then bounding away in terror. However, in a few extremely rare cases, there has been extensive interaction between humans and Bigfoot. In some of these cases, the encounters are decidedly friendly, seeming to indicate that Bigfoot is a caring and benevolent creature. Others, however, take a much darker more menacing aspect, showing that Bigfoot isn’t necessarily always our fuzzy little friend. These two types of outlying cases have a lot to say about the nature of Bigfoot. 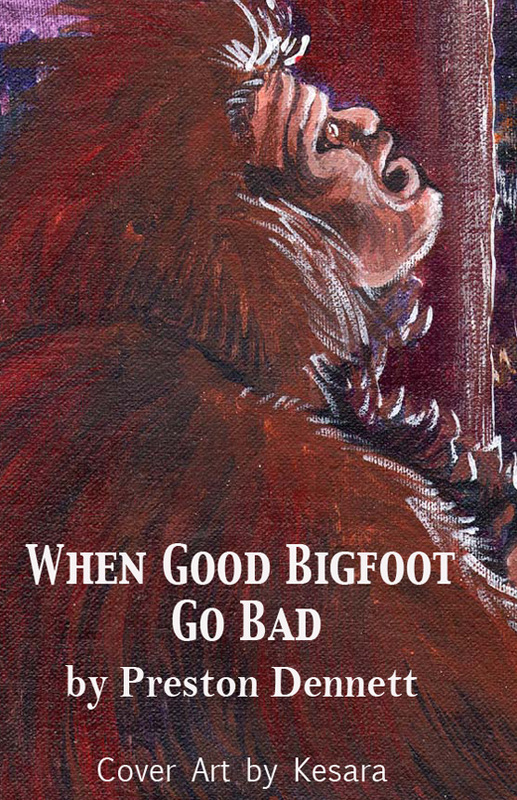 Click the following link to read the first ten pages of "When Good Bigfoot Go Bad"